If you’re a WordPress user, you have lots and lots of drag and drop layout builder WordPress plugins at your disposal. The abundance of layout builder plugins becomes all the more palpable when compared to the paucity of such builders just five years ago. Back in 2012, no matter how many times I looked for a good drag and drop layout builder or at least one that was serviceable, I found nothing but the incomplete and underdevelopment themes and plugins which needed many improvements and additions. Now,thanks to the present scenario, many powerful page layout builder plugins are available, which make it very easy to create the professional layouts within a few hour of work and most importantly no programming skills are required. But unfortunately these layout builder plugins have no control over layout header and footer because these parts are controlled by website theme. Undoubtedly, it is easy to design website body using layout builder plugins but as far as the design of a header and footer is concerned, most of these themes lack drag and drop functionality to modify the header and footer design. In most cases, there is no actual need to create a custom header, because most clients are satisfied with readymade header layouts set by the theme. But as all of them may not be the same, some clients do actually demand weird layouts for header, mostly or partly owing to their lack of knowledge about the website design trends. For a designer who has a good knowledge of HTML and CSS, it is not a tough task to create custom layouts, but for a non-programmer, it is an uphill battle to create a custom professional header layout. Developers too felt the need of a functionality using which a web designer can design header and footer layouts also. The result is in form of some themes finally available with layout builders which allow a designer to control a header and footer layout. It is an addon for Beaver Builder plugin. This plugin supports many themes and even with the free version of Beaver Builder ‘Beaver Builder Header Footer’, you can create custom header and footer designs. However, you can't use different header and footer layouts on different pages. Only a sitewide header/footer replacement is supported. It is a complete WordPress website builder theme which virtually makes you able to create any kind of layout including one with a header and footer. Pro theme comes with hundreds of premade layouts, modules and navigation designs. As I just said, this theme contains everything that you need to create advanced custom layouts including a header and footer layout builder. Additionally, you can create multiple headers and footers and assign any created header/footer layout to any page. Impreza is another top selling multi-purpose theme which is powered by WP Baker layout builder and header builder addons. 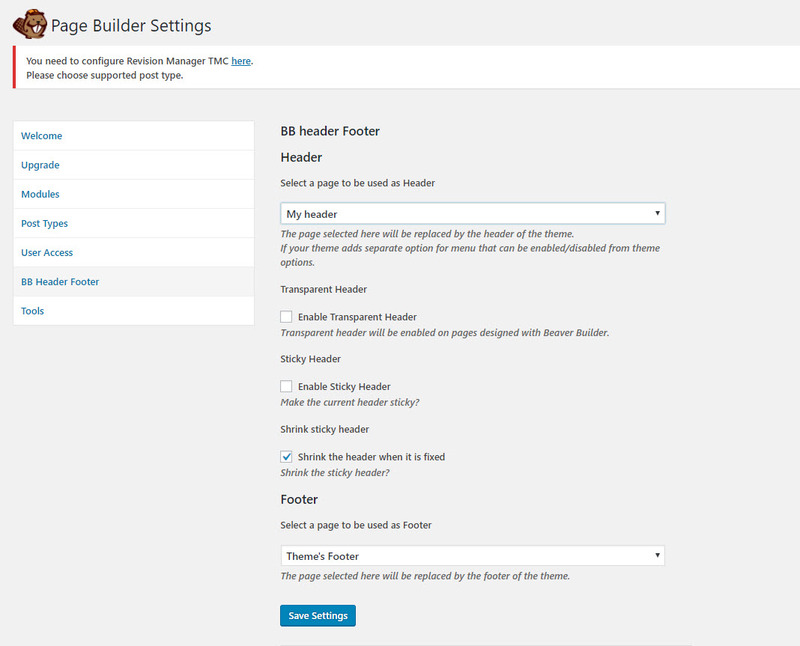 With the help of its header builder addon you can create unlimited header and footer layouts and use them on any page. Impreza header builder comes with its own custom modules and you can create different header layouts for different screen sizes such as desktop and mobile display. Beaver Themer is an addon for Beaver Builder plugin. Beaver themer fulfilled a long-felt need by adding a header and footer support to Beaver Builder theme. Finally you can design a header and footer using Beaver Builder frontend layout builder plugin. The great thing regarding Beaver themes is that you can add its support to any theme by adding provided custom code to the theme function file. Beaver Themer comes with multiple header/footer support for different pages. Ultimatum is a powerful layout creating theme for WordPress. With the help of this theme, you can create unlimited page templates, header and footer templates. Ultimatum lets you create unlimited header, footer layouts and you can use any layout to any page, post or custom post type. On a side note: Creating layouts with ultimatum may initially be slightly cumbersome, but you’ll get the hang of it after a while. Toolset Layouts is a layout creator plugin with which you can create page templates and can use them on different website pages. When it is used with Toolset Starter theme, you can create a header and footer layout too with it. You can create as many header and footer layouts as you want. It’s worth noting here that it may take some time to understand Toolset mechanism and creating layouts may be difficult for starters.